Special Containment Procedures: SCP-808-J is ta be kept in a locked wooden chest buried deep beneath the sands on an isle far way. Ta get ta the fortune that awaits, ya must take 20 paces east past the forked tree, then 30 paces north from the swift stream. It's buried 'neath an X in the sand. But, only the most courageous of all men dare ta disturb old Captain Blue's last treasure. Some say ta this day, his ghost still haunts the island, waitin' fer unlikely men ta try and take his precious booty. Then he snatches them up they're nary seen again. Sailin' ta the isles that hold the lost booty is an adventure itself. Its location can only be found on a map, contained within Davy Jones' Containment Locker 808-J on Ship-19. The island is surrounded by reefs and rocks that only the most experienced seaman can navigate, else he crash and end in the deep blue. Captains are not ta bring woman aboard their ship, even ne'er seen before beauties can bring only the worst of luck. Men that learn the location of the island without permission from O5-R are ta walk the plank. Dead men tell no tales. In order ta survive the long haul, captains are ta bring many fruits aboard ta be savin' even their scurviest of dogs. 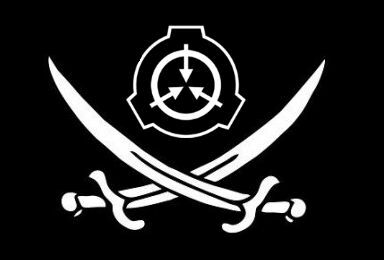 Description: SCP-808-J is a treasure long lost from the knowledge of yer everyday landlubber. Only legends tell of its existence, a vast fortune hidden away by the great Site Captain Blue many years ago. It's said that he who finds the treasure may be the richest man ta sail the seven seas. Foreword: Site Captain Redbeard informed his dearest friend of his voyage into the sea surroundin' Blue's Isle. Q: Polly want a cracker! A: Aye, it was the most brutal voyage I have ever set out upon. A: Me own crew was apprehensive as we sailed inta the fog surroundin' the island. Ya could tell ol' Blue's ghost was hauntin' those shores. Q: Hauntin' those shores! Squawk! A: I was shiverin' in me timbers as we finally navigated the rocks and boarded into the island. The air was thick with devilry, and I looked back ta see me Jolly Roger disappearin' inta the mist. Q: Inta the mist! Squawk! A: Aye, Bucko, I was scared. Me first mate was spottin' fer me, of course. He told me how not even he could see three feet from his face through the damnable fog, and we all grabbed onto each other's hooks and went in single file inta the dense jungle of the island. A: Yes Polly me beauty, we passed by those trees and the swift creek until we finally came ta the X. Then we all dug until we hit somethin'. Q: Squawk! Polly want a cracker! A: Aye, bottles and bottles of rum!